Force India, one of Mercedes' engine users. Mercedes-Benz HighPerformanceEngines Ltd. is an English-based Formula One engine builder. The company used to be known as Mercedes-Ilmor. They are owned by Mercedes-Benz. Since 1995, their engines have been used by the McLaren Formula One race cars. For the 2009 season, Mercedes-Benz also supplied the Brawn GP and Force India teams with engines. 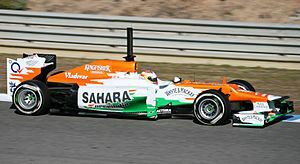 In 2010 season Mercedes supplies McLaren, Force India. They also supply the engines for the new Mercedes-Benz factory team, Mercedes GP, which was formed from the Brawn GP team. Ilmor was founded by Mario Illien and Paul Morgan in 1983, as an independent British Formula One engine manufacturer. The company name was taken from the last names of the founders. It originally started building engines for IndyCars. They received financial support from IndyCar team owner and builder Roger Penske. In 2002 Daimler AG increased its share to 55% and renamed the company Mercedes-Ilmor. In 2005 Daimler became the sole owner of Ilmor and renamed the company Mercedes-Benz HighPerformanceEngines Ltd.
One division of the company was called Special Projects. Since 2003, Special Projects had been building Honda's Indy Racing League engines. 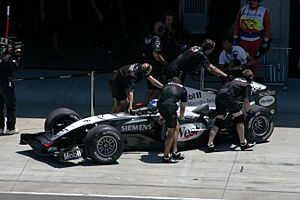 In 2005, Special Projects split from Mercedes-Ilmor and became a separate company named Ilmor Engineering Ltd. Ilmor Engineering is owned by Mario Illien and Roger Penske. This new company is totally independent of Mercedes-Benz. In 1991 Ilmor entered Formula One as an engine supplier. They supplied engines to the Leyton House team. Leyton House was formerly known as March. In 1992, Leyton House changed its name back to March and continued using Ilmor engines. Ilmor also supplied engines to the Tyrrell team in 1992. Powered by an Ilmor V10, Tyrrell scored 8 points, and March 3 points in the Formula One Championship. Ilmor had developed a good name in F1. When the Sauber sportscar-team and Mercedes-Benz were planning to enter Formula One together, they made a deal with Ilmor. However, Ilmor deceided not to put the slogan "Concept by Mercedes-Benz" on the engines. Since the engines were officially called Ilmor, Mercedes backed out of the project with Ilmor. After an unexpectedly fast performance in 1993, Sauber convinced Mercedes to join officially in 1994. In 1994 Ilmor also supplied the new Pacific GP team of Keith Wiggins with the old 1993 version of the engines. Pacific only managed to qualify seven times in thirty-two tries. The Ilmor engine was not the cause of this poor performance. Ilmor became the engine partner to McLaren in 1995. The partnership received its first win at the 1997 Australian Grand Prix. Mika Häkkinen won the driver's championships in the 1998 and 1999 seasons. The McLaren team won the constructor's championship in 1998. After not winning a single race in the 2006 season, McLaren bounced back and won the driver's championship in 2008 season with Lewis Hamilton. In 2001 Paul Morgan was killed while landing his vintage (antique) plane at Sywell Aerodrome, Northamptonshire. This led to Mercedes-Benz increasing their financial involvement in Ilmor, and renamed the company Mercedes-Ilmor Ltd.
Mercedes-Benz HighPerformanceEngines Facts for Kids. Kiddle Encyclopedia.